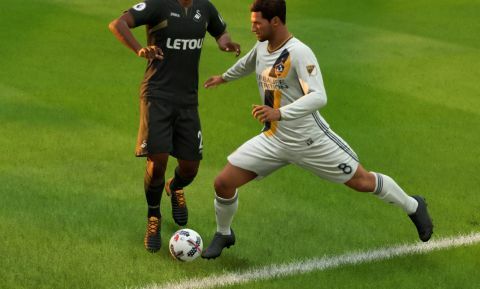 Solid improvements and a strong story make EA's game a top flight player. An improvement in every area, including The Journey mode. What is it? One of the two big name yearly football franchises. Ostensibly FIFA and PES are trying to simulate the same sport. In reality they both approach football in a radically different way—it’s the difference between watching Brazil and Germany. They’re both good, but they’re playing a fundamentally different game. FIFA’s long passes are far riskier and its players move slower, resulting in far more emphasis on rapid short passes. When this works, it’s fantastic. You can get into a mindset where you’re pinging Xavi-esque passes around without even looking because your mind is two or three moves ahead. Yet I still missed the ability to accurately launch the ball across the field, and when you’re not quite ‘in the zone’ it can feel like you’re just moving the ball in circles waiting for a chance to present itself. When I first started playing the AI had a tendency to run up the score with long range shots on higher difficulties, but thankfully a recent patch seems to have toned this down. Things aren’t precisely the same as last year, though. Crosses have been totally reworked, and players generally seem better in the air, turning high balls that would almost certainly lose possession in FIFA 17 into 50/50 chances. In theory this broadens the tactical options available, yet I still found myself falling back on short passing more often than not. I also prefer FIFA’s more active approach to defending than PES, rewarding the player far more for a well timed standing or slide tackle than endless jockeying. It may be less accurate to high level modern football, but it’s so much more fun. Then there’s other little things, like the quick subs button, which lets you swap out a tired player for a logical replacement without having to navigate any cumbersome menus. FIFA 18 is full of clever little tweaks like this, small but nice to have. Worth mentioning is the new Squad Battle mode in Ultimate Team, which gives you the ability to play against other people’s squads of footballer-Pokemon in single player, without having to go online. Not that finding opponents is a problem: unlike in PES I found myself getting games quickly and reliably, and usually with a player of about the same level of ability. Less interesting is the addition of animated cutscenes to career mode, which now seems like a pale shadow of FIFA’s story driven mode: The Journey. I was one of the biggest cheerleaders for The Journey last year, and the sequel is even better. The broad strokes of the plot are thus: Alex is tempted by the prospect of a move to a high profile club, but when the whole thing falls apart he’s forced to move to LA Galaxy instead, exploring a different side of football’s global landscape. Like last year this is used as a backdrop for grounded character drama, with most of the narrative taken up with Alex reconnecting with his estranged father. Meanwhile secondary characters like Alex’s blustering friends Danny and Kim (a new character who plays for the US women’s team) feel three-dimensional, each the hero of their own kind of football story. It would have been very easy for FIFA to deliver a simple cliched tale of sporting triumph, but at every turn it attempts to be more nuanced and complex. It doesn’t always work out. One big mistake this year is the overuse of real footballers. Roles that would have gone to a fictional character last year are now occupied by celebrities like Thierry Henry or Gyasi Zardes. Thomas Muller is a fine player in real life, and there’s a nice thrill to him complimenting Alex, but in the context of the game he’s a thin character with wooden acting, and I couldn’t bring myself to care about him. Meanwhile the match where I briefly took control of Kim, on as a substitute with only a few minutes to make or break her international career, were some of the tensest moments in the game. Fiction is better when it’s fictional. FIFA 18 is an improvement then, an upgrade on last year’s installment in nearly every way. But the majority of people reading this review will be asking a simple question: should I buy PES or FIFA? Unfortunately I don’t have a simple answer for you. I’m scoring FIFA higher because it reliably works online, but if I was playing local multiplayer with friends I’d pick PES. PES doesn’t have anything like The Journey, but FIFA doesn’t have an answer to Master League either. More than ever the two games are offering two radically different experiences, and which one you pick is going to depend heavily on which part of the game appeals to you. Those who can afford it might even consider owning both.